Clarkson is senior fellow for Religious Liberty at Political Research Associates, a progressive thinktank in Somerville, MA. 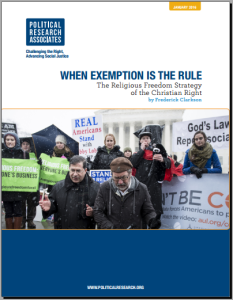 He is the author of the recent report, When Exemption is the Rule: The Religious Freedom Strategy of the Christian Right. Clarkson said today, “The religious freedom claims of leading Republicans speaking at the Republican National Convention belie an effort to curtail the religious and civil rights of others. “Wednesday’s line up may well include Orwellian invocations of religious liberty intended to cloak efforts to diminish the rights of others and to seek exemptions from the law. “Governor Mike Pence signed into law an Indiana state version of the federal Religious Freedom Restoration Act in 2015 which would have effectively allowed businesses to discriminate against LGBTQ people if they claimed a religious reason for doing so. He claimed that it was identical to federal legislation and bills by the same name in other states. But this was false. “Other such bills — including one introduced by then State Senator Barack Obama in Illinois– held states to a high standard of state interest in order to impinge on the religious views and practices of individuals. But these bills did not provide for third parties such as businesses to declare religious exemptions from the law. “A national economic boycott in Indiana compelled Pence and the legislature to amend the law to specify that it was not to be construed as legitimizing discrimination.